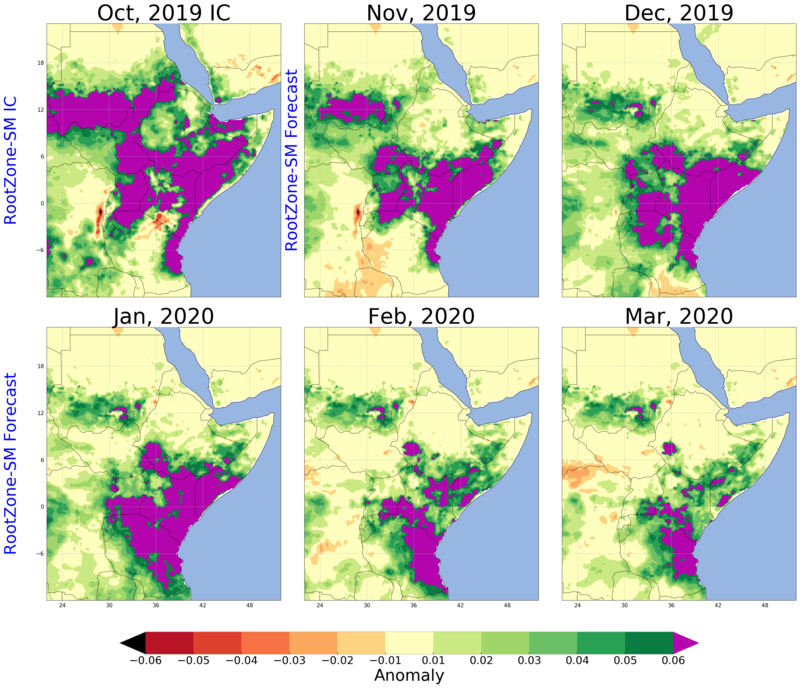 The Forecasting for Africa and the Middle East (FAME) project is funded by the NASA Applied Sciences Program and includes partners from NASA, USAID, USGS, UCSB, ICBA, DoD/ERDC, and Johns Hopkins University. 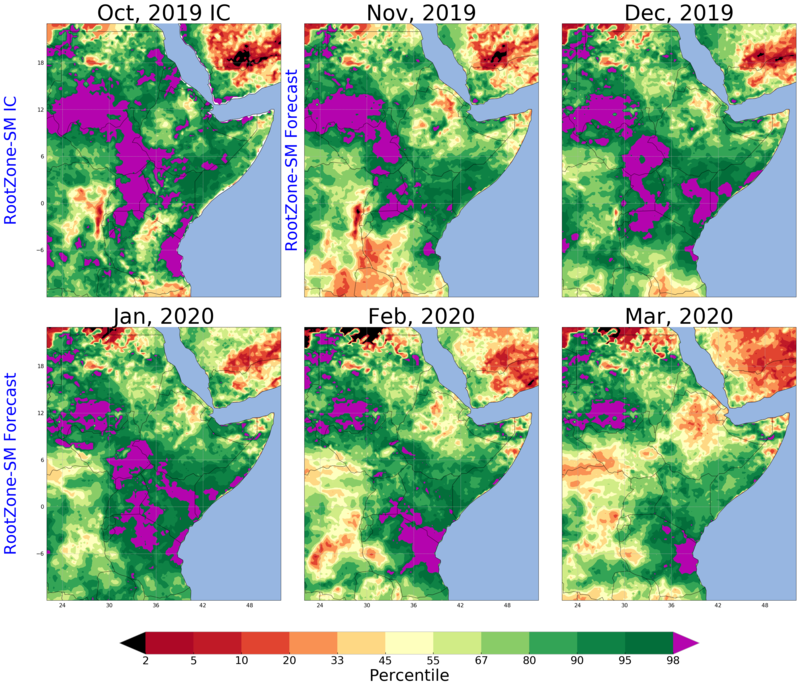 The main objective is to develop a seasonal water deficit forecasting system that is relevant for USAID and USACE activities in the Middle East and Africa based on existing NASA and NOAA Earth science capabilities. Our primary goals include: (1) supporting USAID’s Famine Early Warning Systems Network (FEWS NET) to help better predict water supply deficits related to agricultural drought and food insecurity, and (2) provide a suite of indicators related to forecasted water supply anomalies and conditions and of interest to our end-users. * Disclaimer: The below figures and forecast information are provisionally provided as experimental, and these products are for reference only and at user-own discretion and risk. 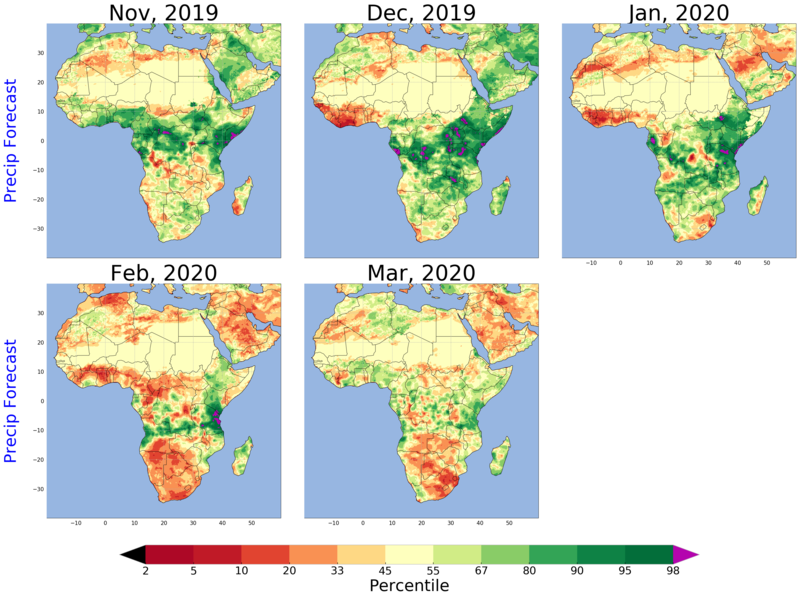 Background: In the left-hand set of plots, monthly percentiles of the precipitation forecasts from the NASA-GEOS-S2S-2 seasonal forecast model are shown, relative to 1982-2010 hindcast (or reforecast) years. 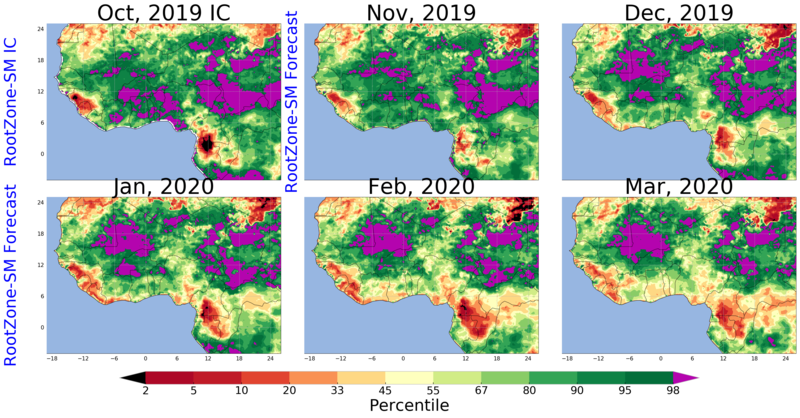 In the right-hand set of plots, the root-zone soil moisture (top 1-meter soil layer) forecasts generated with the NASA-GEOS-S2S-2 forecast inputs are shown using monthly percentiles, relative to the 1982-2010 hindcast period. 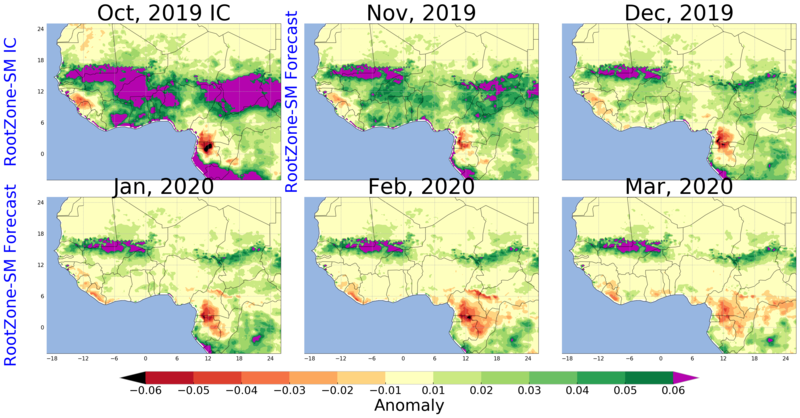 In the upper left figure of the soil moisture percentile panel, the monthly-averaged soil moisture initial conditions (ICs) are shown as well, which are derived from historic model runs using CHIRPS precipitation with MERRA-2 forcing fields, and in the month leading up to the forecast period, CHIRPS-prelim is used to provide earlier released forecasts. 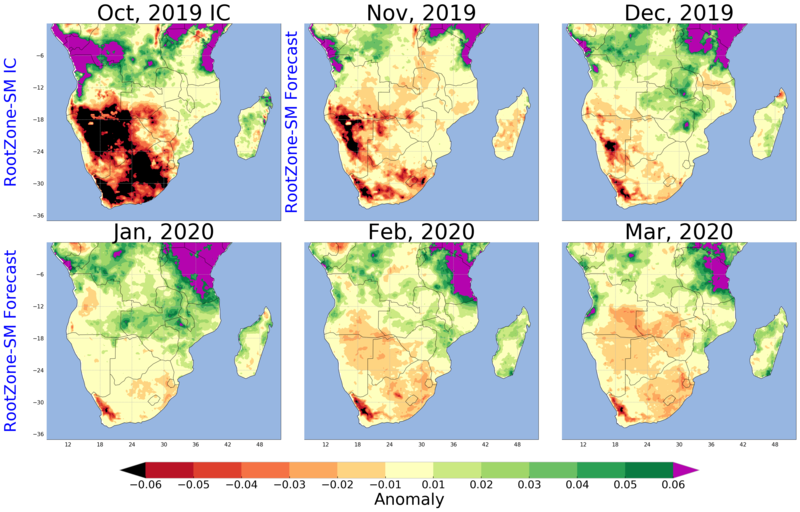 The land surface models (LSMs) used to generate the soil moisture forecasts and initial condition plots include the Noah-MP LSM and NASA's Catchment LSM. 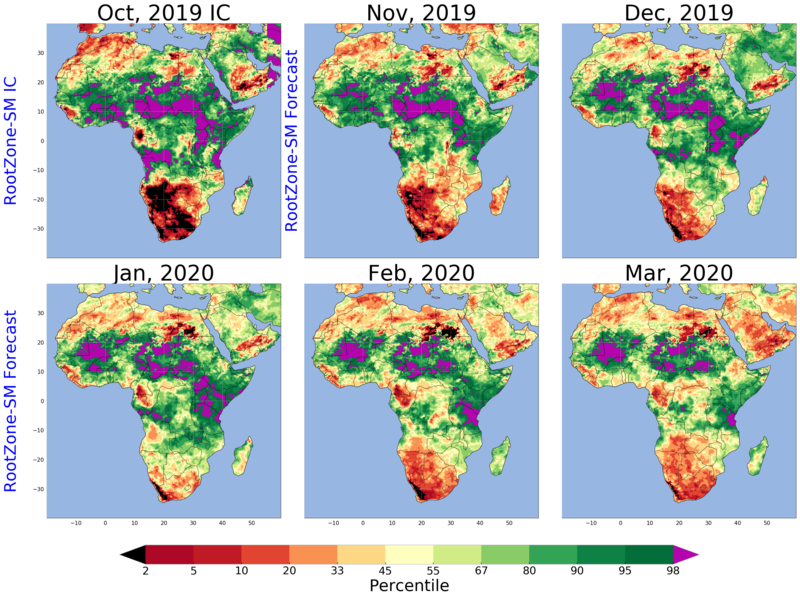 Below, the monthly percentiles (left) and anomalies (right) for the CHIRPS-driven soil moisture initial conditions ("IC") of the forecasts (top-left image of each set of graphics), and the other five images show the forecasted soil moisture percentiles and anomalies for GEOS-S2S-V2, one of the NMME forecast models. Click on above figure for larger image. * Percentile and anomalies are estimated using the climatology during 1982-2010. Background: The likelihood of departure from normal maps above, are based on hydrologic forecasts ensemble comprised of 36 members (1982-2017). Based on those 36 members, these maps indicate the forecast probability (in %) of the given hydrologic variable (e.g. 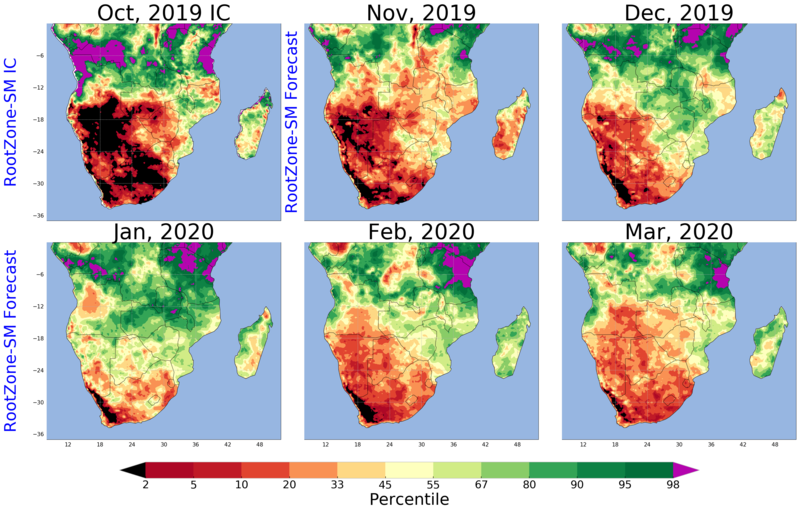 total soil moisture) being in “Above Normal” (>67 percentile), “Normal” (between 33 to 67 percentile) and “Below Normal” (<33 percentile). For example, the grid cells depicted by dark green [brown] color are likely to be in “Above normal” [“Below Normal”] category. ** Probability values are shown only when the probability of being in a given category >40%. *** Note that climatologically the probability of being in a given tercile category is 33%. Contact: A. Hazra (UMD/ESSIC), K. Arsenault (NASA/GSFC) or S. Shukla (UCSB) for more information.